Established in 1997 by the partners of Far Niente, Nickel & Nickel is devoted exclusively to producing 100 percent varietal, single-vineyard wines that best express the distinctive personality of each vineyard. Based in Oakville, CA, on the 42-acre John C. Sullenger vineyard property, construction of a cutting-edge winery facility housed within a vintage 1880s farmstead was completed in the summer of 2003, when the winery officially opened to the public. Guests are welcomed at the Sullenger House, a beautifully restored, late 19th century farmhouse with Queen Anne detail that was built on the site in the 1880s. Guided tours and tastings are offered several times each day, by appointment. Tours begin at the Sullenger House and include a walk through the historic Nickel & Nickel farmstead, restored 18th century Gleason Barn, authentic post-and-beam fermentation barn and underground barrel aging cellar. The tour ends with a seated, guided tasting of a selection of four single-vineyard wines. Guided tours and tastings are offered several times each day, by appointment. Tours begin at the Sullenger House, a restored, 1884 Queen Anne-style home, and include a walk through the historic Nickel & Nickel farmstead, restored 18th century Gleason Barn, authentic post-and-beam fermentation barn and underground barrel aging cellar. The tour ends in the dining salon of the Sullenger House with a seated, guided tasting of a selection of four single-vineyard wines. Four wines, focused on single-vineyard Napa Valley Cabernets, from the same vintage but from a collection of sub-appellations. View from Tasting Room: We are located on the valley floor and have a lovely view of the surrounding mountians. 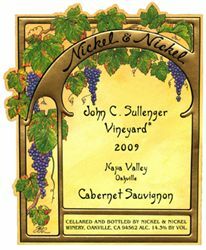 To join the wine club, visit www.nickelandnickel.com or call 707-967-9600. The Nickel & Nickel Single-Vineyard Club was created especially for devotees of vineyard-designated wines from Napa Valley and Sonoma, who enjoy tasting and comparing the exciting and distinctive flavors that an exceptional vineyard imparts to a wine. - Four quarterly shipments each year, consisting of two or three bottles from the Nickel & Nickel portfolio. Prices range from $210 - $230, plus shipping. - Shipments may include advance and current release vintages, as well as wines made available exclusively to wine club members. - A 20 percent discount on the additional purchase of the featured wines for 30 days after each shipment. - A 15 percent discount on additional purchases of wine made anytime at the winery, or by phone. - Complimentary tours and tastings by appointment at Nickel & Nickel, for wine club members, plus two guests per member. - Invitations to exclusive, members-only winery events and programs. - A subscription to the bimonthly Far Niente Family eNewsletter, which will keep you up-to-date on the latest news and events at the Far Niente, Nickel & Nickel and Dolce wineries. Ask a winery associate to begin your membership either in person at the winery, by calling Nickel & Nickel at (707) 967-9600.